When diagnosing computer issues, it is helpful to have a handful of software tools. Many software companies provide downloadable test CD/DVDs (many of them are free) in the form of disk images. They usually end with a file extension of ISO. I recommend a variety of tools on my resources page that require you to burn (write) these images to a CD or DVD. 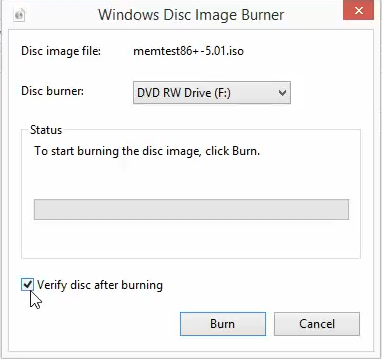 Here are the steps to burn a disk image to a CD/DVD. 1) Insert a recordable CD or DVD into the CD/DVD drive. 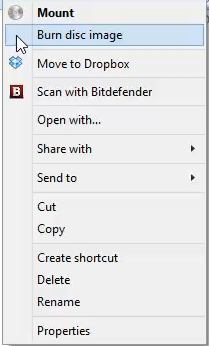 2) Open Windows Explorer (Windows 7) / File Explorer (Windows 8.1). 4) Check the box next to Verify disc after burning. This will add a few extra minutes to the process but is worth it to make sure your image is burned correctly. 5) Click Burn to write the image to the disk. If you have any questions about this tutorial, please post them in the comment section below. Thanks!